I’ve woken this morning to realise I have now been living in my house for 11 years… some years weren’t particularly great, but certainly the last few years have been awesome, up until the last few months! In spectacular form, everything is typically breaking on me! Just before Christmas, my oven decided it didn’t like the temperature I turned it up to (my own fault really) and the heating element blew. So that was a fractious time, having to cook at friend’s houses, however it did mean living off a huge beef joint for several days which is a Keto follower’s dream! This week though, I noticed my fridge freezer was making a rather bizarre noise, almost like heavy breathing… and then it stopped. Just like that, at 11pm on Wednesday evening, my trusty fridge freezer gave up, fully stocked. Fortunately I naturally had a spare fridge in the garage and a neighbour helped move it into my kitchen yesterday in true Chuckle Brothers style! Just as I saved my food the old fridge seems to have come back to life, it clearly needed a break! So now, my plans are to try and jump on a problem before it exists and whilst I appreciate that my lounge is a comfy zone, it has become far too comfortable recently and for my big Spring clean, I would love to totally overhaul it. I have previously written about home improvements and transforming my living room and utilising space and this will be the first room I tackle! A new couch is definitely on the agenda and I am hoping that a different style will reinvent the room and hopefully create more space. I do like the look of this leather sofa from Next, but knowing my dog loves to jump up for a cuddle and snooze, I may just hold out a little longer. Next on the agenda is tackling the lounge windows; I have a lovely bay window but have never made the most of it and need to change this. I am quite liking the idea of window shutters. They look so elegant and appear to open up a room more, creating the idea of a spacious living area. A friend has shutters on her bay window and I am really impressed. It’s a great way to work with a space that for me is normally closed off by curtains, the living room shutters I have researched seem to offer a little more privacy too! I do have some grand plans for my home, but before jumping ahead with extension plans, I think that reinventing my living room space with shutters and a new couch will be slightly less stressful! Do you have any grand plans to redesign your home this year? That leather sofa looks gorgeous! We have a leather armchair and it’s my absolute favourite place to sit in the house. We have so many DIY projects on the list at the moment – the biggest one is replacing the flooring in our living room before the baby arrives in June – I’ve picked the flooring I like so now it’s just ordering it and paying! Our TV AND Washing machine are on the brink at the moment – dreading either of them going! I agree that window shutters look amazing. 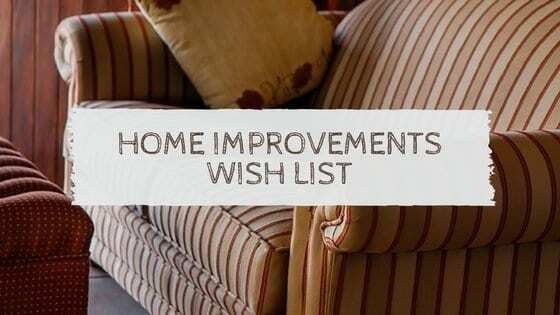 There seems to be a never ending list of projects in our home! Oooh, your poor fridge! Perhaps you use it too much! Haha! We’ve also been looking into shutter but am shocked by the cost! We are going to curtains in our upstairs bay but will need to save for the downstairs bay! This always keep breaking on me! I have so many plans. I keep trying to improve things and then things happen. I decorated the hallway and a week later the dog ripped it off! I sometimes wonder why I bother, ha! I feel your pain! I just replaced the washing machine and the fridge went – though I think my appliances are all good now but still! A spring clean is always great to get rid of stuff you don’t use as well. That always happens, things break at once. That can be so annoying. Love the sofa . We actually have to design a sensory room for our son. Don’t suppose you know much about that ? I love your ideas and to be honest I wouldn’t be the best at DIY but to keep costs down ,I’ve to try ,at least ,eh ?! Oh no, what a nightmare everything is breaking on you – why does it all seem to happen at the same time – I hate that! Love the look of the shutters – makes you feel you’re abroad! Window shutters look so lovely and homely, don’t they? Especially if you have big windows. I bought a new L shaped sofa when we moved last Feb and it was the best thing I ever did, house wise. I love it. Even if our house bunnies have nibbles at the cushions ! Oh we go through stages like this where everything in our home seems to break at once! Within the space of a week (over Christmas too!) our boiler broke, our oven, our kitchen window and our roof leaked!! My wishlist seems to get bigger by the day too! I’m absolutely loving the idea of window shutters when we buy our house! Isn’t it strange how things seem to break or fail all at once? I love the idea of shutters and they would look beautiful on a bay window. That Next leather sofa is lovely and at least it would be easy to wipe off any muddy paw prints! I’ve always got plans in my head to re-design or just re-position something or other – at the moment, like you, it’s a new sofa. I know the feeling! Everything seems to be falling apart all in one go at our house! Today’s disaster was the washing machine! I love the look of shutters too. The heating element blew in our oven recently too, and it only cost £13 to replace it. Me, I would have just bought a new oven, but my husband simply replaced the part and it works good as new!